Here’s a few leftover stats that I didn’t get a chance to share from last week’s NFL games (Week 4). 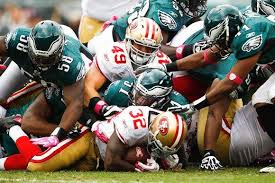 * The Philadelphia Eagles lost to San Francisco 26-21. What was unique about that game was that the Eagles scored 21 points but none of their points came from their the offensive unit. Their scores came on a blocked punt return for TD, an interception returned for TD, and a punt return for TD. The most points scored by a team that did not score a TD via a run or pass play is 30 points. It happened twice, once by Arizona and once by the Bears. Here’s a look at the teams that scored the most points in an NFL game without a rushing or passing TD. 30: Arizona (October 10, 2010) The Cardinals won 30-20 over New Orleans. The Cardinals scored on two fumbles returned for TD, one interception for TD, and three field goals. 30: Chicago (December 5, 1993) The Bears won 30-17 over Green Bay. The Bears scored on two interceptions returned for TD, one fumble returned for TD, and three field goals. 29: Seattle (September 26, 1999) The Seahawks won 29-10 over Pittsburgh. The Seahawks scored on an interception return for TD, a punt return for TD, and five field goals. 26: Baltimore (October 12, 2003) The Ravens won 26-18 over Arizona. The Ravens scored on a blocked punt return for TD, an interception return for TD, and four field goals. 26: L.A. Rams (December 18, 1983) The Rams won 26-24 over New Orleans. The Rams scored on two interceptions returned for TD, one punt return for TD, a safety, and a field goal. 26: Green Bay (November 8, 1981) The Packers won 26-21 over the New York Giants. The Packers scored on an interception return for TD, a punt return for TD, and four field goals. * Baltimore Ravens wide receiver Steve Smith had seven catches for 139 yards and two touchdown receptions last week as he faced his former team the Carolina Panthers. The 35-year old Smith has had three 100-yard receiving games in the first four games of this season. He became the 28th player in NFL history to gain 100 or more yards receiving in a game at the age of 35 or older. Here’s a look at the players 35 years old and older who have the most 100-yard receiving games. * Speaking of receivers with 100 or more yards in a game, the Green Bay Packers had two last week, Jordy Nelson and Randall Cobb. Nelson had 10 catches for 108 yards; Cobb had seven receptions for 113 yards. Both scored two TDs. It was only the second time since 1966 (Super Bowl era) that two Packers receivers both had 100-yard receiving games and two TD receptions in the same game. It happened on December 21, 1969 against St. Louis when Carroll Dale (195 yards) and Boyd Dowler (102) yards also had two TDs apiece. It was also the 20th time since 1966 that the Packers had two receivers with 100 yards in a game (regular season and playoffs). The Packers are now 13-6-1 in such games.